The Fourth Robotic Soccer World Championships was held from August 27th to September 3rd, 2000, at the Melbourne Exhibition Center in Melbourne, Australia. In total, 83 teams, consisting of about watched the events. 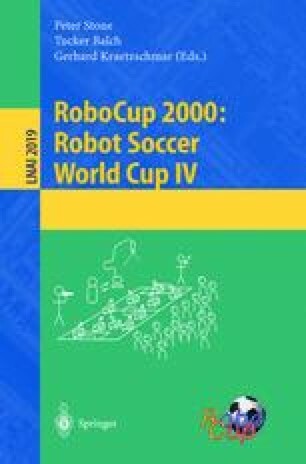 RoboCup-2000 showed dramatic improvement over past years in each of the existing robotic soccer leagues (legged, smallsize, mid-size, and simulation), while introducing RoboCup Jr. competitions and RoboCup Rescue and Humanoid demonstration events. The RoboCup Workshop, held in conjunction with the championships, provided a forum for exchange of ideas and experiences among the different leagues. This article summarizes the advances seen at RoboCup-2000, including reports from the championship teams and overviews of all the RoboCup events. RoboCup-2000 was sponsored by Sony, SGI, FujiXerox, Australon, and RMIT University. The sections of this article reect the work of the indicated authors along with Tomoichi Takahashi and the RoboCup-Rescue team (rescue) and Dominique Duhaut (humanoid).